The emergemce of two politicians of Cuban ancestry as serious contenders for the Presidency of the United States this year has generated a contentious debate within the Latino community as to their “Latino authenticity.” Are they really Hispanic or LINOs (“Latinos in name only)? In a recent Republican Presidential debate, Marco Rubio and Ted Cruz seemed base their Latino authenticity on their ability to speak some Spanish. Others think it is just a question of where you or your parents were born. Still others argue that you are Latinos if you say or think you are. But if it is that simple, why all of the contentiousness over this question? Much of the discussion I see today about naming ourselves revolve around interminable debates over terminology. Should we be called “Latinos” or “Hispanics”? Are these pan-ethnic umbrella terms meaningful at all? Should “Latino” be replaced by “Latino/a,” “Latin@,” or “Latinx”? But none of these disputes seems to address the meaning of these terms as they should be applied to politicians like Ted Cruz and Marco Rubio. At face value, the controversy of their Latino authenticity seems to be simply the result of political partisanship. Cruz and Rubio are not only Republicans, but they are Republicans of the Tea Party variety. The majority of Latino voters are Democrats, and so Cruz and Rubio are out of the Latino political mainstream. Moreover. they both cater to the most rightwing and nativist wings of the party that fuels an intense anti-Latino, anti-immigrant sentiment in the country. But this refers to their political positions, not their race or ethnicity. The other characteristic Cruz and Rubio share is their Cuban ancestry. Representing less than 4 percent of the Latino population, Cuban Americans have enjoyed a special political status within the United States as refugees from Castro’s Communist Cuba. Unlike other Latinos (except for Puerto Ricans), Cubans have received special treatment by U.S. immigration authorities. As a result of their original selective migration and federal support, they over index most other Latinos in their socioeconomic status within the United States. These political, socioeconomic characteristics are important factors in explaining the Republican Party’s courting of this community from among all of the other Latino groups and the degree of Cuban national political success. Although this is changing significantly generationally, Cubans Americans have generally voted Republican in national elections and embrace very conservative foreign policy positions based on their anti-Communist position. This has resulted in some resentment by other Latino communities about the relatively privileged position, the immoderate politics of the old guard Cuban-American community, along with its distancing itself largely from what they considered lower class Mexicans and Puerto Ricans. This raises another complication in the Latino case stemming from its multi-racial nature. While Blackness is tied to skin color, being Latino is not. This and it being based, as currently codified by the Census Bureau, on subjective self-identification, makes it a completely socially conceptualized racial-ethnic category. Without being defined by skin color, it is largely defined culturally, which makes its definition open to a wide range of interpretations. I would argue that this makes the terms “Latino” and “Hispanic” subject to a wide range of cultural traits from over 21 racial, class and linguistically stratified post-colonial countries. However, these pan-ethnic terms have at the same time been racialized within the United States, generating a tension between artificially viewing Latinos as either immigrants or a racial-ethnic minority. 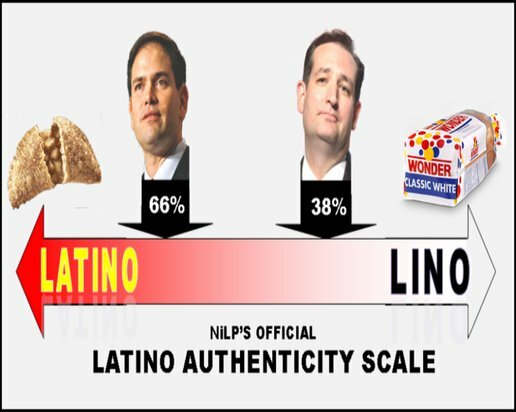 The Latino Authenticity Scale (I made this up), however, is not just dichotomous as most seem to think, but it is also apparently graduated. Rubio, who grew up in the Miami area is considered by many “more Latino” than Cruz who was born in Canada and whose mother is not Latina. When we asked a national group of 341 Latino opinion leaders in December if they considered Cruz and Rubio to be “Latino” or “Latino-in-name-only,” about two-thirds (65.5%) considered Cruz to be a Latino-in-name-only, while, regarding Rubio they were more divided, with 38.0% considering him to be “Latino” and 37.7% to be a Latino-in-name-only. In both cases, about a quarter (24%) felt this was not a legitimate question. Some see this Latino authenticity issue as simply one of a person’s heritage or that of his or her parentage that could be easily adjudicated by Ancestry.com, along with other simple formulations. But as the responses by the Latino opinion leaders, we consulted illustrate, as well as the buzz on social media, the vast majority think it is a legitimate concern. Why is this case? One possible solution is to look simply at representation in two senses: a descriptive and a substantive one. On the one hand, it is a straightforward question of demographic attributes, on the other whether there is agreement on issues and values. Under this formulation, Cruz and Rubio are descriptively Latino, but substantially it is more complicated. By sharing the values of the group they represent, is this group Latinos, conservative or the Republican Party membership? If it is Latinos, do these values have to reflect the majority of Latino views or just a significant number of Latinos? If the majority of Latinos vote Democratic, does being a Republican mean that one is not substantively Latino? This descriptive versus substantive representation doesn’t seem to take us very far in settling the Latino authenticity question. Ambiguity was a critical element of this new Hispanic field. Activists, media executives, and census officials never really defined who Hispanics were, nor did they argue definitively that characteristics like language, place of birth, or surname made Hispanics Hispanic. Instead, they reiterated that, above all, Hispanics were Hispanic because they shared a common set of values and a common culture. The stakeholders used descriptors like hardworking, religious, and family-oriented- adjectives that could be applied to any group- to describe the unique characteristics uniting Hispanics. I remember when was a freshman at Columbia College in New York back in the early 1970s, a bunch of us Latino students (there was only a bunch) joined with Blacks and Asian students in taking over Hamilton Hall to force the college to provide funding to allow us to recruit applicants from the inner city public schools their recruiters always ignored. In negotiating with the college’s admissions people, we demanded that they focus on recruiting and admitting poor and working class Latinos, and warned them against trying to pass the rich children of Latin American nationals as “Latino” or “Hispanic.” These terms at the time had a decidedly political meaning to the student activists involved. Angelo Falcon, an official of the Puerto Rican Legal Defense and Education Fund, railed about the “Latino Horatio Alger story that’s been concocted” about Estrada’s success and, more generally, about the “concocted, invented Latino imagery” of Estrada’s life. In Raymond Williams’ classic work, Keywords, we can see how the meaning of words change over time and are embued with different meanings for the concrete social context of the time. While it addresses big words like “culture”, it provides a framework for Latinos to examine the changing meanings of the words by which they are described. It also points out that words have multiple meanings and uses. The terms “Hispanic” and “Latino” within a political context can assume a meaning that may appear strange or even illogical at first blush but may convey a deeper understanding our community’s experiences and goals. But to achieve this would require greater self-reflection and discussion on our current political realities than has been m the case thus far. This raises the question of who within the Latino community decides a political actor’s racial-ethnic authenticity. Is this the role of some Bureau of Latino Authenticity controlled by Latino elites, or is it the responsibility of popularly-based social movements emerging from the grass root of this community? Given the contested nature of these questions, it will be the result of negotiations between various sectors of the Latino community in political forms that have not fully emerged and that one hopes would be thoroughly democratic and politically progressive. The candidacies of Cruz and Rubio represent an important challenge as to whom and what defines the meaning of “Hispanic” and “Latino.” As the mainstream political parties, the media and the corporate sectors become increasing aware of Latinos as a potentially valuable economic and political commodity, the notion of our community’s self-determination is under constant and intensifying assault. Whether manipulated by these social and economic forces as pliant labor, voters and consumers, part of the resistance to this “social integration” needs to involve defining the terms by which we are identified and the taking back our (or creating a new) narrative as a people or peoples. This will require a much deeper and wide-ranging debate on our collective self-definition firmly based within the Latino community than has been the case so far.